Performance cars are often surrounded by hype and anticipation. Whether it’s a humble hot hatchback or a million-dollar supercar, you can be guaranteed that the vehicle in question will amass a huge following the moment it’s officially announced. Few cars in recent times, though, were met with such wild pre-release expectations as the Jaguar F-Type. Any car that was being positioned as the spiritual successor to the iconic E-Type was always going to capture the imaginations, and the fact it looked fantastic, was claimed to be as equally brilliant to drive and more affordable than its arch Porsche 911 nemesis only increased these expectations. Such OTT hype has the potential to cripple a car upon release if it can’t match these lofty ideals, but not so with the Jaguar F-Type. For sure, it does have some noticeable drawbacks, but on the whole the Jaguar F-Type is a mighty fine sports car that anyone looking at spending $61,000+ will be rather satisfied with. We’re also very satisfied overall with the control layout on the center console. A crucial aspect on a sports car that’s overlooked by some people is the interior. On top of being comfortable and well made, a vehicle like the Jaguar F-Type also needs to a cocooning cabin that further emphasizes its sportier characteristics and differentiates itself from other models in the Jaguar line-up. Thankfully, the Jaguar F-Type Roadster has a very pleasant interior that’s as well built as it is driver focused. Overall fit and finish is on par with a car like this, and a combination of a wrap-around dasbboard, a high scuttle and the low-slung seating position very much endows the Jaguar with a cabin that wraps itself around the fortunate soul who’s driving the F-Type. We’re also very satisfied overall with the control layout on the center console, the infotainment touch screen disaplay and the multi-function steering wheel. Since the F-Type has been on sale for a few years now, there are places where it is feeling a little bit dated, but all the main buttons and interfaces are easy enough to operate. The infotainment display and the gauges in the dashboard binnacle are clear and legible to read, too. It’s a bit of a shame, then, that the quality of some of the materials aren’t quite where we’d expect them to be on a car at this end of the market. Though a lot of the trim pieces are forged from good grade pieces, others do feel a little bit cheap and plasticky for a car with a starting price of $62,000. It’s perhaps best summed up by the steering wheel-mounted shifter paddles on sub-SVR automatic F-Type models: they’re made from a painted soft-touch plastic that feels quite out of place – in comparison, the far cheaper Porsche Boxster with an automatic transmission has aluminum shifter paddles as standard. Perhaps the big drawback with the Jaguar F-Type Roadster, though, is the trunk space. At just 11 cubic feet in capacity, it’s only just big enough to fit a decent sized suitcase in – and that’s assuming you can squeeze it through the rather narrow trunk opening. Unless you plan on carrying smaller items about or have a passenger willing to spend journeys with your luggage resting in their lap, the Jaguar F-Type isn’t the sports car for you if you also require it to be moderately practical. Did you really think it would be awful to drive? This is a sports car, and as such the Jag will probably be more useful as a high-end weekend toy to enjoy during the owner’s down time. As a result of those practicality issues, the Jaguar F-Type can’t really match the likes of the Porsche Boxster and the Mercedes-Benz SLC AMG for day-to-day usability. Still, this is a sports car, and as such the Jag will probably be more useful as a high-end weekend toy to enjoy during the owner’s down time. And it’s here where the Jaguar F-Type really starts to excel. Though the all-aluminum architecture means the Jag isn’t as light as you may have first though (base V6 models tip the scales at nearly 3,500lbs, after all), you won’t really notice that unless you’re really pushing the F-Type hard around a race track. A lot of that is down to the really well sorted chassis setup, with the body control doing its very best to mask the car’s slightly portly bulk. 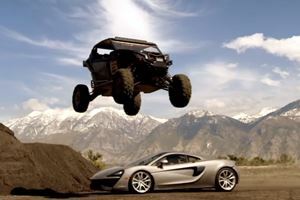 Having light, direct steering and oodles of traction helps matter even further. 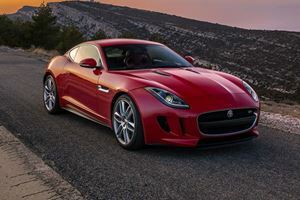 The F-Type is a more forgiving and approachable car in all-wheel drive guise. Said traction can also be improved even further through by going with the all-wheel drive system (optional on the F-Type S; standard on all F-Type R and SVR). Though you can still overcome the limits if you’re especially provocative with your steering, brake and gas pedal inputs, the F-Type is a more forgiving and approachable car in all-wheel drive guise. That said, unless you refuse to drive with traction control on and/or live in a part of the States where As driver-focused as the Jaguar F-Type may be, it isn’t an uncompromising monster when you’re pottering about at the speeds you’ll probably be driving the Jag at for a majority of the time. The ride can be a little bit bumpy over rougher surfaces, but on the whole there isn’t much to complain about when you’re driving the Jaguar F-Type like a normal car. Overall visibility is fairly good as well, with the only big drawback that comes to mind being the slightly hampered rear visibility. Bar that, it’s fairly straightforward to see what’s around you when driving the F-Type. Better still, as the V6 is lighter than the V8, there’s less weight over the front wheels of the sub-400-hp models. Though we said earlier an interior is an important part to a sports car to get right, there are no excuses for not having an engine that lives up to the billing – especially for a car with the provenance of an F-Type. As a result, it’s no surprise to hear the engines in the F-Type are all cracking units. Most buyers will probably end up specifying the 3.0-liter supercharged V6, mainly because it’s mor available in two states of tune: a 340-hp base version, and the 380-hp ‘S’ model. It also helps that both options are substantially cheaper than the higher-tier V8 models, yet are still perfectly punchy enough to have fun with on the open road. It also helps that the V6s have an exhaust note befitting of the F-Type’s character (even before you specify the optional active exhaust system). Better still, as the V6 is lighter than the V8, there’s less weight over the front wheels of the sub-400-hp models, meaning they’re perhaps the preferable option for buyers who prefer their sports cars to be more responsive when turning the steering wheel. We’d also like to point out that the V6 models are the only ones that can be fitted with manual transmissions – which further reinforces the less expensive F-Type’s status as the one to go for if you’re a purist driving enthusiast. In fact, the only real downside to the V8-propelled F-Types is the fact they’re considerably pricier than the V6 versions. Of course, what the V8 models lack in outright handling delicacy, they comfortably make up for in brute force. With the ‘R’ and the ‘SVR’ models packing a punch of 550-hp and 575-hp respectively, they were always going to be quick, with the latter having the straight line pace to worry cars like the Porsche 911 Turbo. Better still, bar perhaps being marginally less agile in tighter technical sections, the V8 models are on par with the V6s when it comes to the ride/handling balance, with some even going as far to say the monstrously quick SVR has possibly the best ride quality of any F-Type on sale today. In fact, the only real downside to the V8-propelled F-Types is the fact they’re considerably pricier than the V6 versions. At $105,000, the F-Type R is nearly 20 grand more expensive than the priciest V6 S, and the SVR adds another 20 grand to the R’s MSRP. For sure, they’re great cars, and we’d probably say “yeah, go for it” if you have that kind of change knocking about, but only you can decide whether you’ll have twice as much fun behind the wheel of an SVR as you would in the base F-Type V6. Jaguar sports cars have a long history. Jaguar sports cars have a long history of being at the more affordable end of the spectrum, and the Jaguar F-Type is no exception. 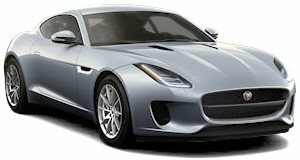 With a starting price of just over $61,000 (for the rear-wheel drive model with a 340-hp V6 and a six-speed manual transmission), the F-Type can be bought for a sizeable sum less than an equivalent Porsche 911, and a similar pattern occurs for most of the F-Type models when compared to their closest competitors from Porsche. Residual values are also exceptionally strong for the Jaguar F-Type, as a result of it being a very desirable car – especially when specified with useful optional extras like dual-zone climate control, parking sensors and heated seats. Then again, as this is a car with an approx. $62,000 starting price in its most basic guise, those goodies should ideally be standard equipment. Admittedly, those features are present on pricier models, but it is a shame nonetheless that some F-Type owners will probably end up paying a fair few dollars just to install equipment that comes standard fit on mid-range family hatchbacks and sedans. Since all F-Types come with an 18 gallon fuel tank, you should get a decent enough range out your F-Type in between stops at the gas station. Fuel economy also isn’t terrific (if understandable for a high-end sports car), with the official EPA figures suggesting you’ll struggle to get more than 18mpg and 28mpg out of the most efficient V6 versions in the city and on the highway respectively. Since all F-Types come with an 18 gallon fuel tank, you should get a decent enough range out your F-Type in between stops at the gas station. Though the type of people who own cars like these probably won’t need to budget for gas money, they also shouldn’t need to put too much money aside for maintenance work. The F-Type uses a lot of components used in various other Jaguar models, and - as all F-Types come with a five-years/60,000 miles warranty that also includes free scheduled servicing intervals – there shouldn’t be any need to invest more money into the F-Type on parts other than standard fare consumables like brake pads and engine oil. Lister will be lifting the wraps off its new F-Type based sports car early next year.